Short game is just too short. on the bright side, Chris Cooley is really blossoming as a color commentator on ESPN980. he's dominating the color over Sonny anymore. At some point the team has to say, "Eff it. We're going to lose anyway playing so tight, let's just let loose." We seriously look like another 3 win team this year. HOW is this progress? ? Did you expect progress with a rookie coach and 2nd string QB? So sick of Orakpo's BS. He talks such a good game but he never shows up. Yes. Like almost every other new coach. I expected a change in attitude and a focus on fundamentals. WHO are these guys covering out there? Each other? Looks like it's gonna be an early night again this week. The Skins miight have to move to the ACC after this game. 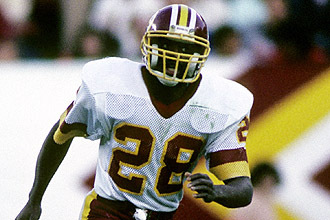 23 yrs for Dan Snyder and we're in the same shape as the day Gibbs 1 retired. This franchise is on life support. We couldn't survive there either. Vowed not to watch the game and for the first time in my years as a fan have held strong. From the comments looks like it's for the best. On top of it all, they keep taking away my effing fantasy points! Give the refs credit ... they're trying to keep the game interesting. My local HS team is more disciplined than this. Oh, that's being generous. We flatlined decades ago. 2012 was an involuntary muscle twitch. Harvin scored more points in two plays than the Skins will ALL NIGHT. I'm watching just to hear John Gruden's take on this team. Second quarter and they're making up phantom calls to help us out. At least the Nats won. I literally couldnt care less about the Skins. Well this kills the bs about the ref conspiracy against us. The refs have looked out for us everytime they scored on us. Might wanna ignore CPND too cause it is gonna get ugly here too. Bye RGIII! It was a great year! He doesn't seem too enamored with Hazmat's defense ... but, I could be wrong.